7/7 Inquests: Examining and documenting the proceedings of the Coroner's Inquest into the London Bombings of 7 July 2005, including analysis of the hearing transcripts and the evidence presented. 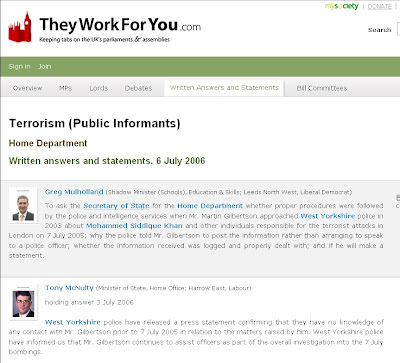 When Martin Gilbertson gave his witness testimony to the 7/7 Inquest, under questioning from Hugo Keith, he merely repeated the same lies he had told to various media outlets when interviewed in June 2006. September 11th, 2001: in front of a television set a computer shop in Beeston, Leeds - where I was working - aghast at the news, watching the Twin Towers fall. I will never forget, as the second plane crashed into the World Trade Centre's South Tower, the cheers of the people in the room around me. I was horrified by what I saw, while they screamed their hoorays. Next day, September 12th, with details coming out about the connections to al-Qaida, the owners of the shop and some of their 'brothers' from the area held a celebration party: drinking pop, passing round crisps - cheering, shouting their delight at what they saw as an attack on the infidel, Satanic USA. Q. [Hugo Keith QC] In September of that year, did you come across an organisation called Technology Bits and Pieces in Dewsbury Road in Beeston? Q. Did you start working there after a fashion? A. Yes, I started doing work there. Q. When did you start working there? A. In the summer of that year -- was it 2001? -- I think, 2001. Q. Was Technology Bits and Pieces in essence a computer shop? A. It was a Learn Direct centre which also built and sold computers. Q. A subsequent interview that you gave reveals that you were working there at the time of the terrorist attacks in the United States of America, 9/11. Q. What was the atmosphere like in that shop, Technology Bits and Pieces, when it became apparent what had occurred in the United States? A. They were happy, they were basically cheering it and laughing that such a gross attack could be perpetrated on America. Q. Were you shocked or surprised by that? A. I was shocked and surprised, but not as surprised as I could have been, to be honest. A. I'd had many discussions in there about Islam and, as an atheist, I don't believe in God, so that was causing me some personal problems with them. Q. Was there anything about their general approach that indicated, at that stage, a level of extremism? A. Not too much, no. It was just the fact that I was an atheist, it was rubbing them the wrong way to a point. Q. The following day, were you in the computer shop, 12 September? A. Yes, I was there to repair a computer for them. Q. Was the atmosphere similarly jovial the following day? A. Yes, they were having a party. 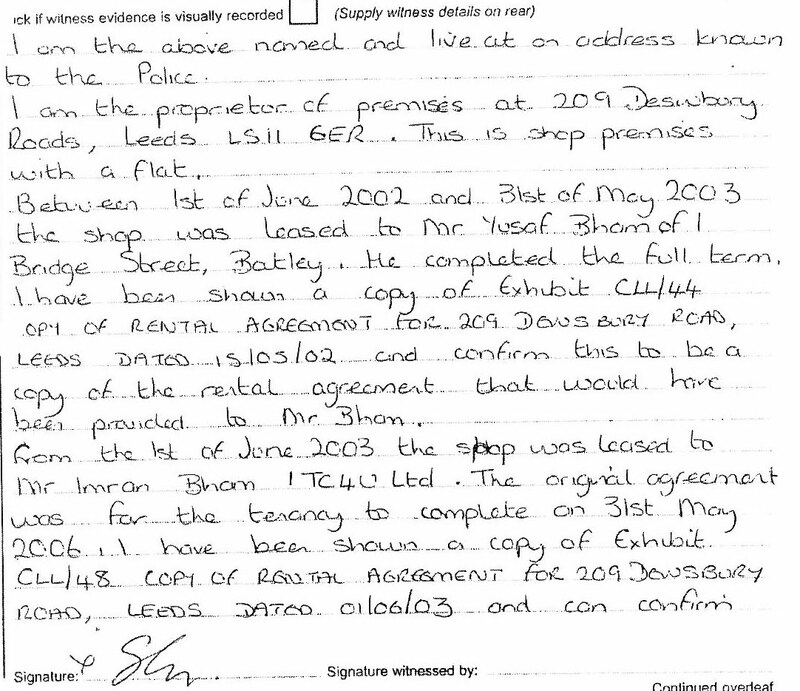 By the time of the Inquests: West Yorkshire Police knew that these claims were a lie - the shop Gilbertson claimed these 'celebrations' had taken place, Idoo PC, was raided in September 2005 . 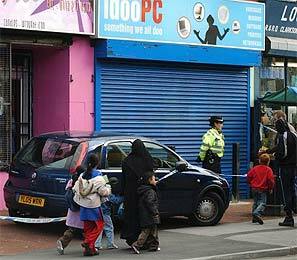 Two months after the initial raids in Leeds, police staged a fresh wave of searches – this time storming a computer shop in Beeston and a training centre in Sheffield. The Idoo PC shop on Dewsbury Road in Beeston was raided on September 13 and its sister business IT2 Home, in the Darnall area of Sheffield, was raided three days later. All computer equipment was seized from both properties because it was believed the bombers could have had access to them. The owner of the Beeston enterprise, Imran Bham, is known to have been friends with those who ran both the Iqra and the Hamara Youth Action Point. Mr Bham's home on Bridge Street in Batley was also raided. No charges have arisen from the operation, but again, officers say the investigation is ongoing. Idoo PC's management tried to keep the business open in the wake of the raids, but finally closed the shop for good a month later. Staff claim that although police have never found any evidence of criminal activity, customers stayed away because of its association with the terror inquiry. One member of staff, who did not wish to be named, told the Yorkshire Post: "We were put out of business by what happened last year. "We tried to get the computers back from the police but we weren't able to. We can't even get an audit of what they took. They took every single computer – customers' machines, and even the dummy one which we kept on display with flashing lights. "People didn't want to touch us after that." He said Learn Direct, the Government backed organisation which funded the Sheffield business, had also cut ties with the business since the police raids. He added that when officers raided Imran Bham's home address, the bomb squad was brought in to test large plastic containers which turned out to be full of holy water. 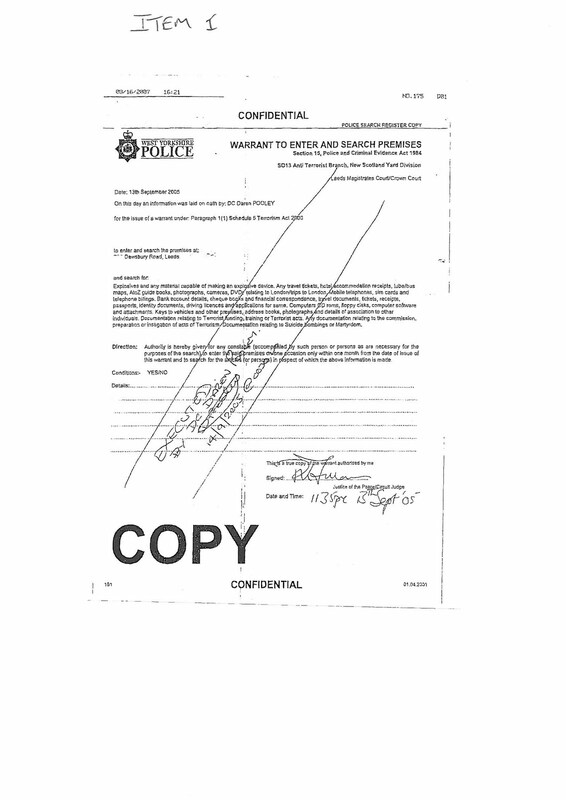 By the time of the Inquests: West Yorkshire Police had taken two statements from Martin Gilbertson, the first in July 2005 over a period of two days in a hotel as Gilbertson claimed 'he feared for his safety'. This was arranged with WYP by the Daily Mirror after Gilbertson contacted them and been interviewed. 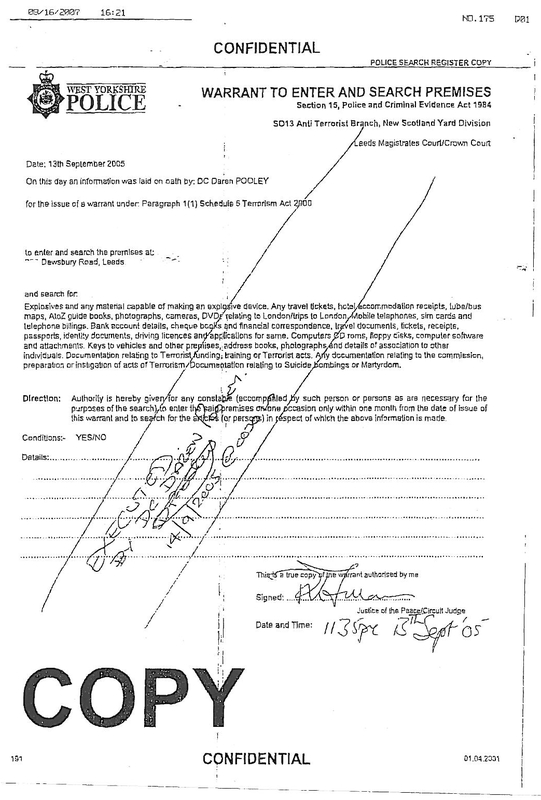 His second statement, amounting to 29 pages, was taken in June 2006. His testimony above was adduced from these statements. MR BEGGS: Mr Gilbertson, it comes to this, that from 7 July, and the 18th or 19th, you somehow couldn't contact the West Yorkshire Police, but you did manage to contact the Daily Mirror? Q. Is that because, Mr Gilbertson, the sad truth is that you are an egocentric self-publicist, a fantasist, exaggerator, speculator, irresponsible individual? Q. [Mr Beggs] If you turn back a couple of pages, please, to page 18, you suggest in the second paragraph of the version for the court with the inquest number on it, you say: "On another occasion whilst at Iqra, it was shortly after the news broke regarding the execution of Ken Bigley." You go on to describe an incident at the bookshop, don't you? Q. Mr Bigley was murdered on 7 or perhaps 8 October 2004. That's a matter of public record. Do you understand, Mr Gilbertson? A. Yes, I understand. It must have been later than July that I left. Q. Well, or is it perhaps the case that you simply have no regard to accuracy whatsoever? A. As far as I'm aware, all the statements I made were true and accurate. Q. That one can't be, can it, because we've just established on your account you'd left Iqra and yet you're able, you say, to relate an incident that you couldn't have been present at. Do you see? A. Yes, I agree, yes. There is that there. Q. Do you agree with me that the truth, Mr Gilbertson, is you have no real regard for accuracy and fact, do you? By the time of the Inquests: Martin Gilbertson had not been charged with giving false evidence or wasting police time. Yet Imran Yaqub Patel was prosecuted and jailed for lying about information concerning the events of 7/7 which caused a wasteful diversion of police resources in investigating his bogus claims. 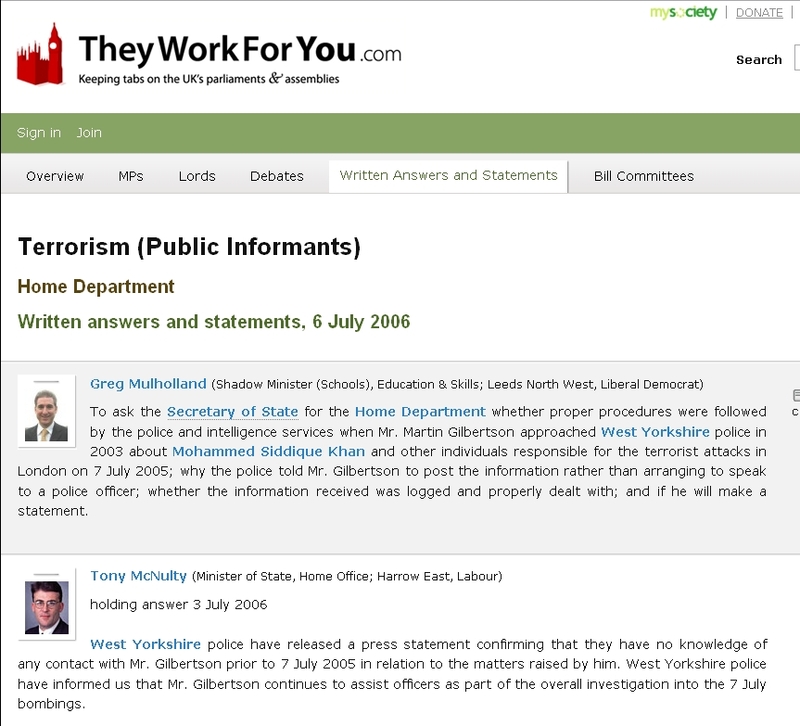 By the time of the Inquests: West Yorkshire Police had spent tens of thousands of pounds and hundreds of man hours investigating Gilbertson's claims that he had posted disks to them in an attempt to warn them of the extremism in the community prior to 7/7 - all expended to protect their reputation against his allegations, whilst caring nothing about the impact of his lies on the wider community and Imran Bhan in particular. Q. You know, don't you, I think, that there was an extensive investigation led by a detective superintendent from West Yorkshire Police who advanced 12 distinct and, again, extensive lines of enquiry to see whether there was any truth in the suggestion that you had posted something? A. I did not know that, no. 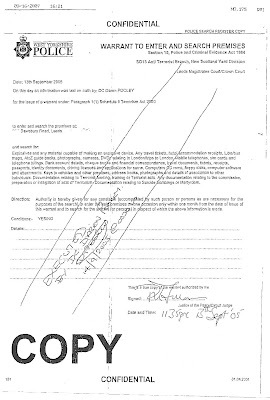 By the time of the Inquests: the only people to have been charged and imprisoned in any connection to Operation Theseus - the investigation into the events in London on 7th July 2005 - were not 'Islamic radicals' but two police officers investigating the Beeston community; including the Metropolitan Police officer who executed the search warrant for Idoo PC, DC Darren Pooley. A copy of Imran Bham's Witness Statement to the 7/7 Inquests can be downloaded here. The Coroner merely referred to Gilbertson as being "not an accurate or reliable witness" - Rule 43 report at para 23.
as far as I can see, a prosecution for perjury seems unlikely. 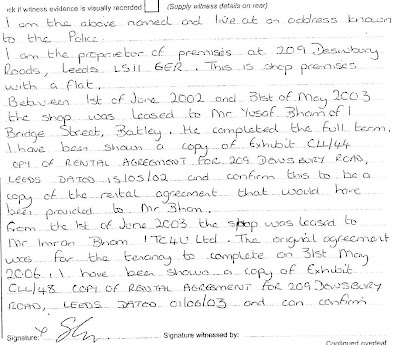 We are aware, as you and WYP no doubt are, that Mr Imran Bham did not have a Learndirect business in Dewsbury Road Beeston in September 2001. This was known by WYP before Mr Gilbertson gave his testimony at these proceedings and which are now a matter of public record. 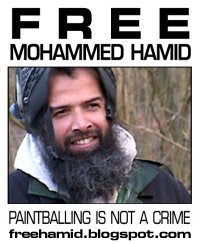 Yet an appalling smear on the Muslim community in Beeston, a community that has suffered greatly since the events of 7th July 2005, was sworn into evidence by him with his allegations of celebrations at the events of 9/11 in a premises operated by Mr Bham. As Mr Beggs accused Mr Gilbertson of being "an egocentric self-publicist, a fantasist, exaggerator, speculator, irresponsible individual" can we now add liar and perjuror to this list? Will WYP now be instigating proceedings against Mr Gilbertson on the basis of wasting police time, malicious allegations, attempting to pervert the course of justice and perjury? Will WYP, both in their submission on the verdicts and publicly, be issuing an apology to the Beeston community and Mr Bham for allowing these unfounded and malicious smears to be adduced into evidence by Mr Keith's questioning of Martin Gilbertson? The Final Curtain - "CCTV rich" to "CCTV FAIL!" Something is happening here & you don't know what it is, do you, Mr Jones?